Lotty’s War is from Wednesday 3rd to Saturday 13th September 2014, ahead of its West End transfer. Starring Olivia Hallinan, Mark Letheren and Adam Gillen, the national tour of Lotty’s War opens at Guildford’s Yvonne Arnaud Theatre on Wednesday, September 3rd and runs until Saturday, September 13th, before its London West End transfer. 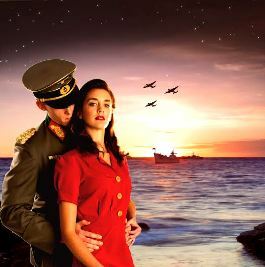 Directed by Bruce Guthrie, one of the most popular emerging talents in the world of theatre, Lotty’s War is set during the occupation of the Channel Islands in WWII; the only piece of Britain occupied by the Germans. Founded on recently found diaries, Lotty’s War is a fascinating story of love, courage and betrayal written by Guernsey-born Giuliano Crispini. On the 28 June 1940, a squadron of German bombers raided the main harbour of Guernsey, killing 44 islanders, including Lotty’s Dad. With the last boat to England gone and the brutal German Army taking hold, Lotty is housed in close quarters with the enemy. In a turbulent struggle between her loyalty to her homeland and the temptations of forbidden love, will Lotty dare to tread a passionate and dangerous path to save a friend? This forgotten chapter of British History is brought to life on stage by Olivia Hallinan, who is best known for her role as Laura Timmins in the BBC adaptation of Lark Rise to Candleford, as well as having starred in the critically acclaimed Sugar Rush; Mark Letheren, who starred in Wire in the Blood, Casualty and The Bill; and Adam Gillen, who is best known for his roles in Benidorm and Prisoner’s Wives. Be among the first to catch this passionate wartime thriller in Guildford before it commences a UK tour and West End run.